Fancy red diamonds are considered the holy grail of all fancy colored diamonds. 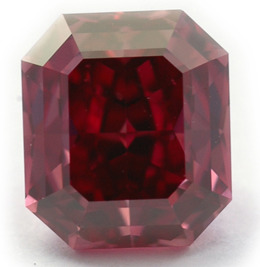 It is an undisputed fact that natural pure red diamonds without any secondary colors are the rarest of all. These particular diamonds are so scarce that the world renowned Gemological Institute of America (GIA) did not issue a single grading report for a diamond graded as only "Fancy Red" from 1957 to 1987. Natural red diamonds are indeed so hard to come by that up to a mere thirty are known to exist. Not surprisingly, due to the total dearth of fancy red diamonds, this particular diamond color commands the highest price per carat and will only continue an upward trend. Red diamonds are not just rare; they are said to be the rarest of all natural fancy color diamonds. This makes them extremely sought after by diamond enthusiasts and collectors alike. What is the origin of natural fancy red diamonds, what sets them apart from other color diamonds, and where does the red color come from? All of these questions and others will be addressed below. Collection Of Natural Fancy Red Diamonds. Fancy color diamonds are found in twelve different colors, but with over 230 color combinations and in various locations around the globe. The majority of red diamonds in particular, originate from Australia, in the Argyle diamond mine which is known for its production of some of the world's finest pink, violet, blue, and brown diamonds. However, a large percentage of these diamonds have also been found in Brazil, Russia, and India. An Extremely Rare Fancy Red Radiant Shaped Diamond. The common denominator among all color diamonds is the fact that they all possess a color in contrast to colorless diamonds, which lack color. However, other than this aspect, every color diamonds has its own characteristics as it owes its unique color to separate causes. Additionally, as a result of each and every color diamond's rarity, each color category has a different value. Color diamonds that are more abundant are generally also found in larger sizes whereas as very rare diamonds such as red diamonds are usually on the smaller side when discovered. 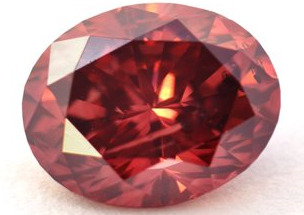 Like many other color diamonds, fancy red diamonds can be found in one pure color or with secondary hues, which include Purplish, Brownish, and Orangy. While other colors come in several intensity levels, red diamonds come in one intensity level alone: Fancy Red. The cause of the highly coveted color in red diamonds remains undetermined although the prevalent theory is that, much like in pink diamonds, structural defects that arise from small movements occurring in the atoms, a process referred to as 'plastic deformation,' give these exceedingly rare diamonds their distinctive color. The structural defects materialize as a series of tightly positioned grain lines that exude red color. Color intensity in red diamonds is directly correlated with the amount of graining present: more graining means a more intense red diamond. Various impurities and elements are the causes for color in color diamonds. Red diamonds are similar to pink diamonds in terms of the cause for the color. It is not completely clear what the cause is but it is believed that deformities in the crystal lattice is what creates the pink color, and in this case, red hue. A very intense level of this deformity results in the bright red color. Straight Fancy Red oval shaped Argyle Tender red diamond. Some fancy red diamonds exhibit fluorescence when placed under UV light. These diamonds will have a faint or medium blue color. In the final analysis, the enhancement to a stone's aesthetics that fluorescence offers is entirely subjective. Because round cuts tend to produce lower color saturation, red diamonds, like other colors, are generally cut into fancy shapes such as radiants, pear shapes, cushions, etc. Round cuts cause color desaturation because they are best at reflecting white light, which also gives them their scintillation. In the case of red diamonds, a round cut may make the red color appear weaker, whereas a fancy shape, which reflects less white light, will maximize color saturation. Take note of uneven color distributions as well (these will be noted on your GIA certificate), as they can certainly affect a diamond's appearance and value. It is not uncommon for red diamonds, no matter how small, to be sold for six digit figures per carat and even seven digit figures for more coveted ones. The rarity of red diamonds directly influences their value, because natural red diamonds seldom appear on the market, their demand is understandably great. The prolonged thirty year dry spell during the late 1950s to the late 1980s where the GIA did not encounter a single diamond that earned a grade of 'Fancy Red' is a testament to the scarcity of fancy red diamonds. All natural fancy red diamonds are valuable, but ones with unmodified color , those that exist as pure red without any secondary colors such as purple or brown, are the most valuable of all. Needless to say, red diamonds in general represent excellent investment opportunities. While all fancy red diamonds make superb investments, the best options for red diamonds are those that have deeper color saturation and the largest size your budget can accommodate and the market can supply. Color, size and clarity, in that order, are the biggest factors that determine red diamond price and overall value. As mentioned earlier, the red diamond is a rare specimen. This results in high prices. As time goes by, the awareness for color diamonds in general and color diamonds as wise investments specifically, is increasing greatly, which translates into a high demand for these beautiful natural gemstones. It is unclear how much remains from the red diamond sources that are accounted for; therefore the value of the red diamond is constantly rising. The figures are high, but whatever the numbers are presently, they will grow significantly in the near future. Unlike color diamonds such as yellow and pink diamonds, which are purchased by consumers, investors, and collectors, Red diamonds are mainly bought by collectors and investors for the purpose of investment and completing collections. A pure red diamond, which is mostly desired, is very difficult to obtain, and when available, demands sky high prices. Nevertheless, for those serious about investing in a red diamond, or adding one to their growing color diamond collection, the red gemstone will not disappoint. Its beauty and glamour, not to mention value, is nothing short of satisfactory. Fancy Purplish Red Asscher Cut Diamond. Although it contains a secondary hue, this stone still remains extremely rare. Fancy red diamonds are among the rarest colors in the fancy colored diamond family. Red diamonds are so rare that they have dwelled in relative obscurity up until the late 1980s. Little has been written about the history of red diamonds thus far. What remains certain is that red diamonds rose to prominence in April 1987 during a Christie's auction where a 0.95 carat round brilliant cut Fancy Purplish Red diamond fetched a record-breaking $927,000 per carat. Since then the excitement surrounding red diamonds has fluctuated in rhythm to announcements of new red diamonds emerging on the market. In 1998, the New-York based William Goldberg Co. cut and sold the largest fancy red diamond to be graded by the GIA to date, a 5.11 carat shield-shaped fancy red diamond, a stone that would come to be known as the Moussaieff Red and one of the key attractions of the Smithsonian Institution's "The Splendor of Diamonds" exhibit in 2003. Like every color diamond category, there are famous red diamonds too. These include The Moussaieff Red, a 5.11-carat, Fancy Red diamond with an IF clarity grade. Known as the largest internally flawless red diamond in the world, this stone is one of the most magnificent stones in existence, and The Hancock Red Diamond, a 0.95-carat Fancy Purplish Red, round brilliant diamond. Though the latter diamond is less than a carat in size, it is still among the most famous red diamonds of all time due to its fabulous color. Just to put some perspective on the value of these top quality Red diamonds, here are the prices these remarkable stones sold for at auction. The Moussaieff Red sold for nearly $8 million back in 2001, placing its value at $1.6 million per carat. The Hancock Red, in contrast, was sold in 1987 for approximately $880,000. That is $926,000 per carat, but today such a diamond would fetch far more.